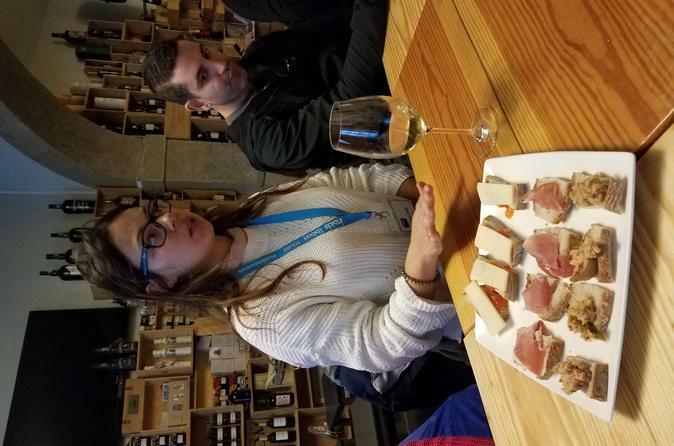 Savor gourmet foods from Portugal during this 3-hour, small-group guided food and wine tour of Lisbon. Taste cheese, pastries, and Port; enjoy a Lisbon wine tasting from the Alentejo; and learn why this region produces some of the world’s best wine. Plus, your guide will provide you with tips on the city’s best eats. This tour is limited to 15 people to ensure a personalized experience. Food tour suitable for vegeterians, please note any special requirements at the time of booking. Meet your guide in central Lisbon (Praça de D. Pedro IV) and begin your small-group gourmet food and wine tour. Throughout the tour you’ll meet locals and learn about traditional Portuguese dishes and culinary culture. Warm up your taste buds during a visit to a local restaurant, with petiscos — Portugal’s version of tapas. Learn about Lisbon’s cafe culture with visits to the 18th-century Café Nicola, a terrific spot for tertúlias, and discover why Pastelaria Suiça is another landmark of Rossio. You'll also have a chance to try the famous Portuguese Codfish Cake with a glass of refreshing vinho verde (green wine). Continue to a wine bar in the Bairro Alto quarter for tapas and a glass of local white wine. In the 20th century, the Bairro Alto became Lisbon’s bohemian quarter and the center of its nightlife. Visit a much-loved local restaurant, known for its seafood and steaks. Then head down the steps of Calçada do Duque, where you'll find a variety of restaurants with great esplanades and music. The area is especially popular during the summer months because of the views over Castle Hill. Then discover the 100-year-old secrets behind Lisbon’s most delectable sausages, salted Bacalhau, hams, and cheeses at local gourmet shop. At a nearby bar, sip a classic Portuguese cherry brandy and note its similarities with Port, Portugal's famed fortified wine. Learn about the history of the sweet drink as you taste it alongside a piece of São Jorge cheese. Learn the history of Ginjinha, the favorite liqueur of many Portuguese, as you sample it in a nearby bar. Afterward, go to Portas de Santo Antão Street, one of the city’s main entrances, where part of the old Fernandine wall once sat. Finish your gourmet Portuguese food and wine tour with a meal at a gorgeous 17th-century palace. 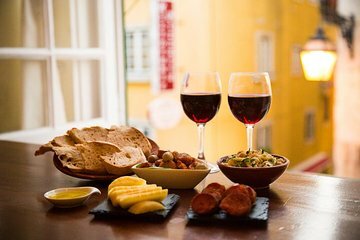 Taste chouriço sausage, bread, and other local products served with a glass of delicious red wine while admiring one of the most captivating Lisbon interiors. Your tour will conclude here. The tour was a great way to get an introduction to Portuguese food and drinks. Was plenty of both plus a little history and sightseeing. What an wonderful evening! We tastes nice wine and fingerfood, met wonderful poeple and our guide was great! Ricardo was an excellent guide! So full of information and knowledgeable! Made everyone so comfortable and a kind person. I throughly enjoyed this tour. Would totally recommend this adventure! Saw new places we would not have seen , also gave us some short cuts for getting places. Very worth the time and price. Carolina was a great guide and brought us to some hidden gem/local favorites. We ate and drank our way through a couple local neighborhoods. Fun way to meet other tourists too! Definitely recommend!! Such an enjoyable 3 hours of walking, drinking and eating - 12 in our group and met in an easy to find spot by the statue in Rossio Square - Sofia was our guide - she was fun and informative and organized everything beautifully - got to try some classic tastes of Portugal in some iconic spots - really enjoyable - delicious drinks and light bites and would highly recommend - thank you! We thoroughly enjoyed our food tour of Lisbon with the wonderful Tiago. His knowledge of the city and the tips that he gave us for the rest of our holiday were excellent. Tiago looked after the group which he calls his 'family' incredibly well and pointed out areas off the beaten track that we otherwise would never have discovered. The food and drink stops are well chosen both in terms of letting you see different parts of the city but also as they are diverse in nature, from a speciality deli to a small bar/food outlet frequented mainly by locals, a wine bar and to finish a beautiful courtyard setting with a table prepared for us. We cannot recommend this type of tour highly enough and will definitely do similar tours on future city breaks. I was drawn to this tour based on the description and my friends and I weren't disappointed. We visited 5 places and enjoyed both food and drink in 4 out of the 5. We were also introduced to different parts of the city. In addition to learning about the food and drink, our guide, Pedro, shared Lisbon history. It truly was an enjoyable 3.5 hours. During the tour, I had asked Pedro if he enjoyed his work and he smiled and said that he did. At our last stop, we sat and chatted with him and the other participants on the tour. As I watched Pedro, his enjoyment was evident. He was interested in sharing more of Lisbon with us but also wanted to know about us and our visit to Lisbon/Portugal. He was as important to the experience as the food and drink.